Notes: Prudhoe Castle is a ruined medieval English castle situated on the south bank of the River Tyne at Prudhoe, Northumberland, England. It is a Scheduled Ancient Monument and a Grade I listed building. 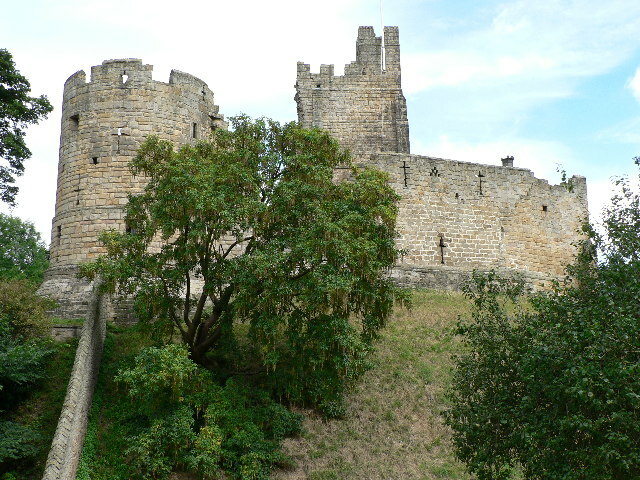 The castle stands on a ridge about 150 feet (46 m) on the south bank of the River Tyne. It is partly enclosed by a deep moat. The ground to the north falls away steeply to the river. The castle entrance is on the south side and is flanked by a mill pond on the left and a ruined water mill on the right. The castle is entered by a barbican dating from the first half of the 14th century. The gatehouse, dating from the early 12th century, leads into the outer ward, which contains the remains of several buildings. At the north side, against the curtain wall, are the remains of the Great Hall, measuring 60 ft by 46 ft (18m by 14m), built by the Percies when they took over the castle. At the end of the 15th century a new hall was built to the west to replace the existing one. On the west side of the outer ward is the manor house, built in the early 19th century, and containing a visitor�s shop and exhibition rooms. At the south end of the manor house is a gateway leading into the inner ward. The main feature of the inner ward is the keep, dating from the 12th century. The keep has walls 10 feet (3.0 m) thick and its internal dimensions are 20 ft by 24 ft (7.3m by 6.1m). It originally consisted of two storeys beneath a double pitched roof.